This complex, with it's turn-of-the-century ambience, will create an exciting new shopping destination in the heart of Fairhaven's historic district. A Victorian-style three story building, that blends with the Fairhaven neighborhood, will offer street level retail space with upscale residential condominiums above. 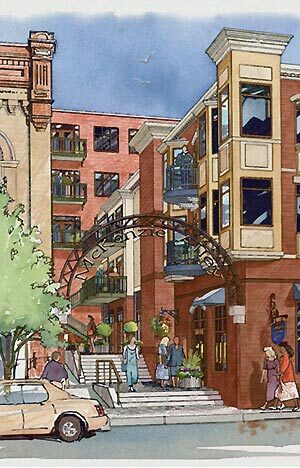 The Young Building will sit away from its neighboring buildings, creating an inviting shopping corridor, called McKenzie Alley. The public will enjoy a blend of boutiques, specialty shops, and deli/espresso cafés in a relaxing atomosphere replete with bistro tables, container gardening, and a possible water feature. It will offer class A commercial spaces for office, retail, and restaurant uses and will be ready for occupancy in the Spring of 2008. Exposure to high traffic count estimated at 10,000 vehicles a day on 11th Street, 12th Street and McKenzie Ave.